Order within 21 hrs 0 min 58 for delivery on Wednesday. MONEY-SAVING BUNDLE - Save money with this great bundle of 2 x corner units and a standard chrome shelving unit. 1 x ADAPTABLE CORNER UNITS - This unit makes those awkward corners more accessible. 2 x STRAIGHT CHROME SHELVING UNITS - Coordinated with the corner unit. These 1200mm wide units are ideal for displaying or storing a wide range of products. EASY TO ASSEMBLE - No tools required for simple and quick assembly. The lightweight units can be built in minutes. Take a look at our 'How to Assemble' video here. FULLY ADJUSTABLE - Each shelf can be quickly and easily adjusted every 25 mm allowing you to store or display products of various sizes. SOLID STEEL CONSTRUCTION - With a high load capacity of up to 150 kg (UDL) per shelf, these units can cope with heavy products making them ideal for warehouses and storerooms. EASY-TO-CLEAN AND HYGIENIC - The chrome wire is easy to wipe down and allows for better air circulation, great for catering and medical use. STYLISH AND FLEXIBLE DESIGN - Versatile and attractive modular system for displays and storage that will complement any shop, office, restaurant or kitchen. COORDINATED RANGE AND ACCESSORIES - A large selection of complementary accessories and additional shelving so you can expand as your requirements grows. Q. What load can each shelf take? A. 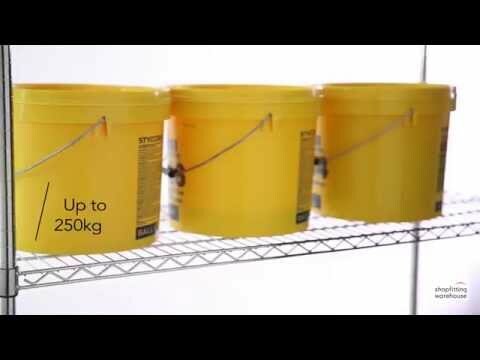 Our standard duty shelves have a uniform distributed load capacity of 150kg. Our heavy duty shelves uniform distributed load capacity is 250kg. Also take into consider the capcity per unit when using accessories such as castors. Units should never be loaded top heavy and heavier or heaviest items should always be stored on the bottom most shelf. Q. Do you do chrome wire shelving in 800mm wide? A. Our standard sizes are 450mm, 900mm and 1200mm wide. Q. Is it possible to add extra shelves to this product? A. Yes, you can buy the individual shelves and components separately here. Q. What is the height in between each shelf? A. All the shelves are adjustable in 25mm increments so you have full flexibility how you arrange your item.